Going on from yesterday's post on Webinar tool use to minimise travel, I'd like to look at best practice when using GoToMeeting to deliver your sales demo to a new prospect. Firstly, you and your Sales rep should have already contacted most of the people on the call to find out exactly what is driving the opportunity. This is your customer's pain points, and every presentation you give them should be aligned to this particular customer's pain points. Just like in a face to face presentation, welcome everyone to the call, check that the meeting's parameters are all understood. Do the standard round table thing so you know who is on the call, this might flush out some additional attendees for you. 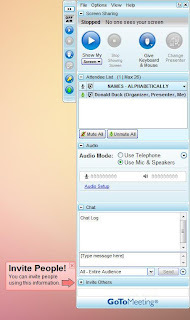 Remember, while GoToMeeting gives you a list of who is logged in - and their email details - you still could have additional lurkers sitting with those attendees, or even people dialed in without using the web client. Make sure people see your starting slide or screen. This should be up and ready 5-10 minutes early so that people don't get a blank screen or worse - see your last minute scrambling for time getting things ready. I like to use dual displays for doing a presentation on GoToMeeting, and I'll tell you why: I find GoToMeeting lacks some of the features more expense software like Webex have, such as Slideshow or Whiteboard modes, so I use powerpoint in full view on the secondary monitor, which gives me those features. On my other screen, I see the GoToMeeting console, and I have my application running, so that I am ready to share it. 10 minutes early, I open the slideshow and start sharing that screen. I make sure (if I haven't already) that my application demo is ready to go. As people join, I greet them, ensure that they are on both the webinar and the telco, and see if any extra people are joining too. Often you might start with the Salesperson giving a quick slide presentation to uncover the business needs. As an SE, write down these needs as you go, and if you can possibly refer back to them during your demo, do so and tick them off as you do so. If your sales rep doesn't do this, take the initiative to outline this yourself. I have had customers so excited after the early discussion and pain point finding, that they see the value in the demo themselves, and you often get away with a very quick view of the actual product. Ensure that you get the same value out of a webinar as a live meeting. It should either qualitfy the deal further, or directly move towards closing it. Have your business goals written out in front of you during the meeting, and note down the solutions as you go. A lot of this is part of your standard demo, but very importantly, you need to adapt your standard demo to work online. You must practice, you must be familiar with the toolset you use, and also, you must ensure that you get the strengths of your solution across - tailored to the customer perspective. 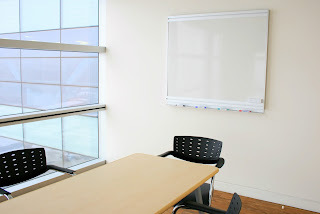 Remember whiteboarding, slides, and even the product demo all look different when presented online. What is powerful live may not be online and vice versa. After the webinar, call your customer contacts and check that the reaction you wanted was achieved. Follow up on your action items promptly and check that the prospect has as well. Plan towards the next step in the process and drive the customer. Some steps of the sales process may need to be in person - that always gives you a better feel for the personalities involved. Once you have a good rapport with the customer, gotomeeting can be a great tool to support, show additional benefits of the solution and above all, keep in touch with the customer without incurring a large cost to go and visit them. This makes it a great tool, as it helps move deals forward without wasting a lot of time or money. As a GoToMeeting newbie, I really appreciate these tips. I had my first sales demonstration on it today. All went really well and is almost as good as being there in person! Thanks for the great tips! Yeah, it is true that effective sales presentations lead to better sales and hence higher profits. Today every business wants to improve and speed up communication and as a result they use quality tools like RHUB, Gotomeeting, WebEx etc. for conducting sales demos.